Victrix has their new Rome's Italian Legions box sets now available over in their webshop. 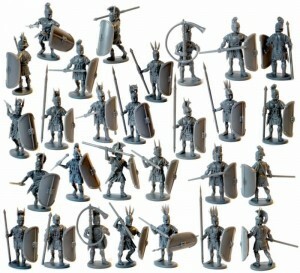 We are really pleased to announce the release of our Third set of Republican Romans 'Rome's Italian Allied Legions'. This is a superb set of figures. The detail is wonderful and crisp and will make painting a real pleasure. You get 60 figures in the box for only £29.95 including plastic command, light infantry and plenty of head options. Not only can they be used as Rome's allies you can make Oscan warriors from these figures by swapping shields and heads here and there with the Victrix Greek sets. Brutians, Campanian Hoplites and un-armoured Italians by using the Velite bodies, thus allowing to create a whole range of foes to fight the might of Rome. (We will show some of the conversion potential soon). We really hope you like these figures as we are overjoyed with the results. Our figures are just getting better and better with every release. The 3 Roman sets are all on sale now and we have 2 fantastic multi-box post free worldwide deals for you.